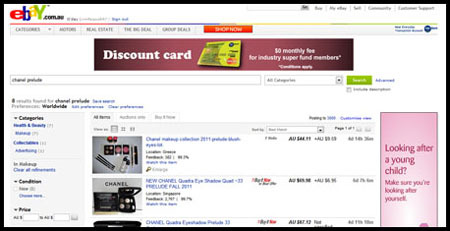 Since I've been on eBay for such a long time, I thought I would share with you some tips on how to buy smart on eBay. This includes how to make sure that you are getting an authentic item, how to make sure you get the best bargains, and many other tips. I'll be breaking this down into a few parts, because of the sheer volume of information I want to share! I know a lot of you want your items as quickly as possible, and a local seller seems ideal because you get your items quicker and there is less of a chance that the package gets lost in the mail. However, international sellers can get better deals. You also have a wider variety of items to choose from. Taking a trip to the mall would take time, and it's the same thing with online shopping. Allow yourself time to search for a particular item, because chances are, it will take you a while to find it. This is because a search for "Jemma Kidd Dewy Glow All Over Radiance Creme" might not get you the result you want, but "Jemma Kidd Dewy Glow" might, for various reasons. However, the latter search term might also get you other hits for a similarly-named product, so you will have to take the time to scan through all the listings before you finally find the particular product you want. A major mistake most people make is inputting too-specific terms into their search. Bear in mind that the words you might use to identify a particular item may not be the words that someone else uses. For example, use the word "concealer" instead of "concealer-stick". Also be wary of the fact that some people misspell things, so factor that into your search. This was only very recently introduced to the eBay search system, and it's been a total godsend! Sellers had actually started listing their items at 1 cent and imposing ridiculous shipping fees like 30-40 USD, so it was getting pretty tedious and annoying to search through these. With this option, you know you're getting the best deal possible! Just click on the drop-down menu at the top right corner, right above the listing results, and click on this option. That's it for this post! These are really just simple matters of common sense, really, but it doesn't hurt to write them down and put them in one place, right? I'll be publishing another post with more in-depth tips next week, so stay tuned if you're interested!